Crested geckos require higher humidity and lower ambient temperatures than most commonly kept reptile species, so a glass terrarium is a great choice for them. We recommend using a terrarium measuring 45 x 45 x 60cm (18 x 18 x 24”), this is a tall terrarium which suits their arboreal (tree climbing) life style. Coconut fibre substrates or one of the bio-active forest substrates are ideal for Crested Geckos as this can be kept moist (which helps keep the humidity high) without the substrate growing mould. As these geckos are nocturnal, it is important to provide cover for hiding behind during the day. Plastic and silk plants are great for this. Branches should also be provided for climbing on. Crested geckos thrive in live planted bio-active terrariums. These make beautiful displays! Crested geckos require a day time temperature range of 22° c to 27° c (72° f to 80° f) with the optimum being 24° c to 26° c (75° f to 78° f). At night temperatures can be allowed to drop as low as 13° c (55° f).Temperatures over 30° c (85° F) are dangerous for the gecko. These temperatures can be achieved by using a heat mat mounted on the outside of a wall and controlled by a thermostat. The UV light (see below) will also provide some heat. Always use digital thermometer to check temperatures. Crested geckos are crepuscular, so the lighting requirements are different from diurnal species but still very important. A 5% UV light should be used to help the gecko use the calcium from its diet. A 10-12 hour light cycle will be fine. It is recommended to replace UV lights every 6-12 months (depending on type and brand of lamp) due to a decline in UV output. Crested Geckos are omnivorous, meaning they eat live insects and vegetation. In the wild, their diet is high in small soft fruit (non citrus), along with whatever invertebrates that happen to be within striking distance. In captivity we use one of the many crested gecko diets which are available. A treat of fresh soft fruits (and baby food) like Banana, Peach, and Apricot, are relished by Crested Geckos (but should not be relied upon), as well as crickets, and as a treat small locusts, mealworms and wax worms. 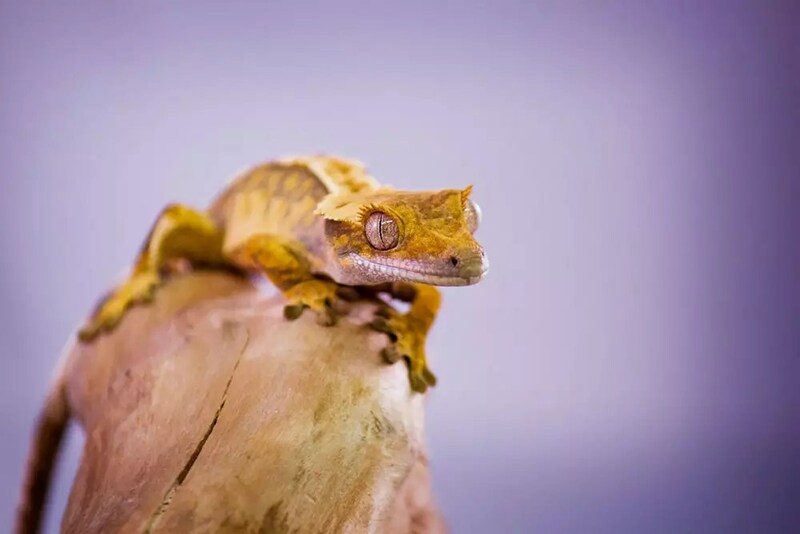 Livefoods should be coated in a vitamin and mineral supplement to ensure the Crested Gecko is getting the best nutrition possible.A bowl of drinking water should always be available and the enclosure should be sprayed daily with water. The gecko will drink the droplets formed, and it will also raise the humidity of the terrarium. Crested Geckos are a good lizard for handling. They should be treated gently, and be encouraged to sit on the hands. They naturally get around by jumping from branch to branch so be prepared for it to jump up onto your shoulder. Never grab or pick up a Crested Gecko by its tail as they will shed the tail as a defense mechanism. It will not grow back! Males do not get on with each other as adults and will fight, so only keep one per enclosure. Males can be kept with a group of females providing the terrarium is large enough to accommodate them. Females are ok to be kept as a colony. If you have males and females together, expect them to mate and lay eggs! Regular spot cleaning of the terrarium should be performed to keep it hygienic for both the animal and the keeper. Change the substrate once a month or as required and clean the terrarium with a reptile safe disinfectant.